"If you're lucky enough to be in the mountains, you're lucky enough!" You will see that quote in lots of places here in the Blue Ridge Mountains, but this cozy little cabin embodies the quote. 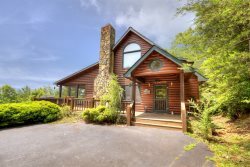 Tucked into the woods, you can enjoy your privacy, yet you are only about 15 minutes from downtown Blue Ridge. You may never want to leave when you start feeling 'Lucky Enough'. TV`s: living room 40", 2nd bedroom 26"